The launch of Intel’s new Skylake processors and chipsets right around the corner, like many other companies showing of there z170 motherboards. 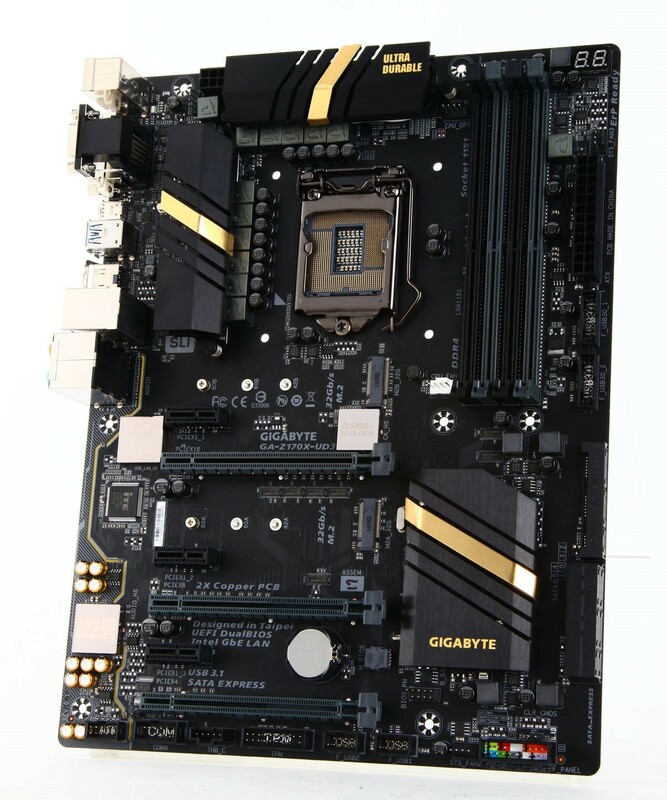 GIGABYTE has showed its Gigabyte GA-Z170X Gaming G1 and GA-Z170X-UD5 TH UltraDurable-series at computex 2015, now they includes four new products with the Z170 chipset. 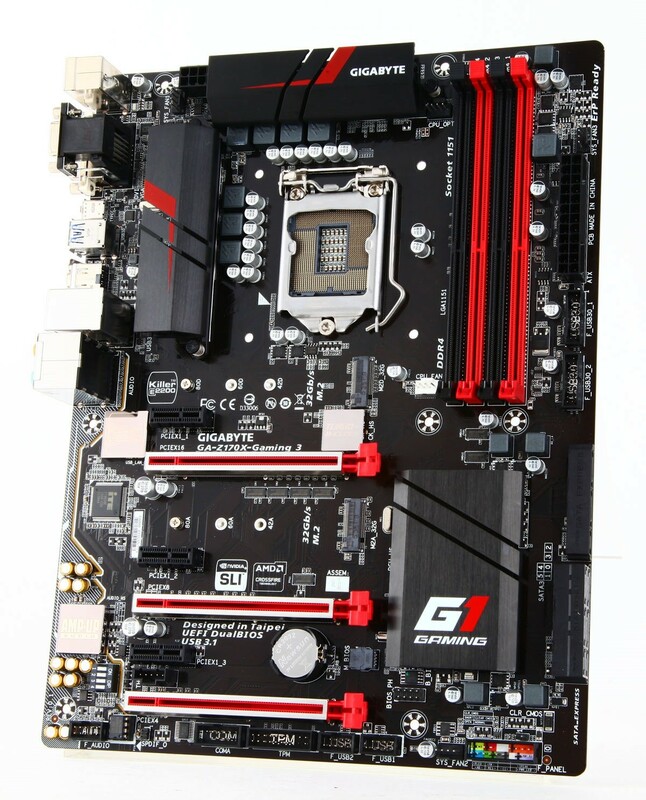 The Gigabyte GA-Z170X Gaming G1 is the flagship motherboard of the lineup. Featuring a LGA 1151 socket with DDR4 standard with speeds of 3400 MHz + (O.C) support, this motherboard comes in an E-ATX form with a 24-Pin ATX and single 8-Pin connector. The motherboard has a 22 Phase power design which is Digital Power Phase Design with a Gen.4 IR Digital Controller and Gen.3 PowIRstage ICs. There’s also the high-end black capacitors and a Built-in Advanced Performance Tuning IC Turbo B-Clock chip that is able to push the range of BCLK frequency tuning in ranges from 90-200 MHz. Gigabyte redone there new thermal design, that will cover a large thermal frame that extends from the I/O to the bottom most Sound Blaster chip. The new thermal armor design makes the board more attractive and sturdy. The heatsink is a large copper based solution with water cooling ready with G1/4 threaded fittings. A similar heatsink is featured on the PCH and thermal armor for the SATA ports. Talking about SATA ports, there are 10 SATA III 6 GB/s ports and four SATA Express ports. Two USB 3.0 front panel connectors provide 4 USB 3.0 ports while two USB 2.0 ports can also be found at the bottom of the port. Expansion slots include four PCI-e 3.0 x16 with metal shielded and three PCI-e 3.0 x1 slots. As this is a new board, it also features two M.2 SATA ports, rated at 32 GB/s (each). The motherboard comes with a Sound Core Audio chip that drives a 7.1 channel, gold plated audio jack. Two LAN ports powered by the Killer E221 chip offer seamless net connectivity with Bluetooth 4.1 and Killer E1535 802.11 AC. There is a single HDMI 2.0 display connector along with a display port while other I/O includes several USB 3.1 (Type-C), USB 2.0 ports and even a PS/2 connector. 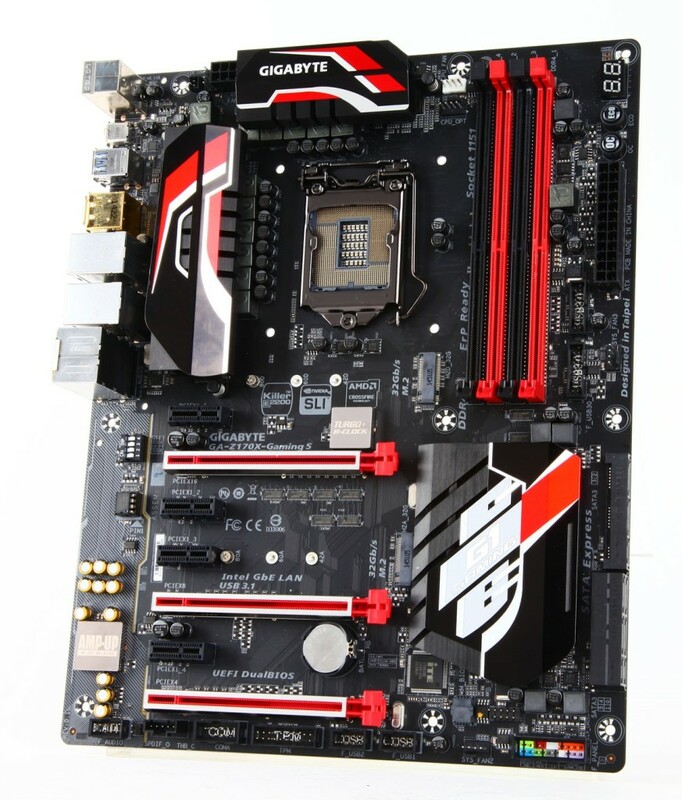 The Gigabyte GA-Z170X Gaming 7 is a more cost effective offering of the G1 itself. It keeps the thermal armor heatsink is a little toned down now there no water cooled solution. A single 8-Pin and 24 power connector with12 Phase Digital Power Design. The motherboard has four DDR4 DIMMs that allow support for new DDR4 and capacities of 64 GB. Gaming 7 has three PCI-e 3.0 x16 and three PCI-e 3.0 x1 expansion slots. Like the G1, the Gaming 7 also comes with metal shielded expansion. There are also two M.2 slots with 32 GB/s rated functionality. Storage options include eight SATA III GB/s and two SATA Express ports while USB options include two USB 3.0 internal and two USB 2.0 internal headers. A sound core 3D chip provides access to a 7.1 channel gold plated audio jack. Other I/O options include the Killer E221 powered LAN ports (2x), USB 3.1 (Type-C), USB 2.0, Display port, USB 2.0, USB 3.0 and a single PS/2 port. Moving to the more budget friendly tiers of the lineup, we again see more features toned down. The GA-Z170X Gaming 5 gets rid of the fancy thermal armor and comes with red and black color scheme with touch of white color. This motherboard also has a 12 Phase Digital Power layout with a single 8-Pin and 24-Pin connector. We again see four DDR4 DIMM slots, three PCI-e 3.0 x16 slots with the metal shielding but get an additional PCI-e 3.0 x1 slots which make a total of 4. Also featured are the two M.2 ports while storage gets a bit toned down to get 6 SATA III 6 GB/s ports and two SATA Express 16 GB/s ports. Two USB 3.0 and two USB 2.0 front panel headers can be found internal while I/O on the rear includes HDMI 2.0, Display Port, Dual LAN ports, AMP-UP Audio (Core3D) powered 7.1 channel audio jack, USB 3.1/USB 3.0/USB 2.0 ports and a single PS/2 connector. 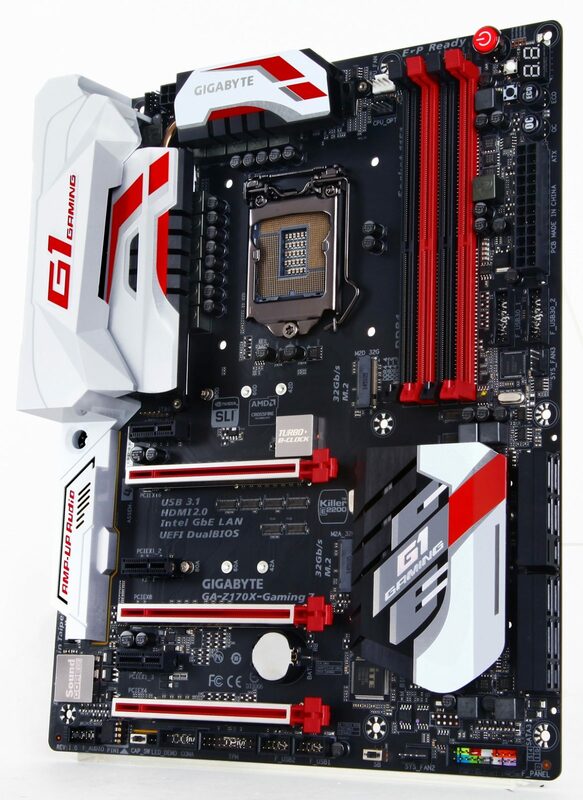 The Gigabyte GA-Z170X Gaming 3 is the most entry level motherboard in the Gaming series with a 8 Phase Digital Power Design that powers the socket and power provided by a 8-Pin connector. The motherboard has four DDR4 with a regular copper based heatsink that cools off the PWM along with the PCH. Bearing the G1 Gaming logo, metal shielded 3x PCI-e 3.0 x16 slots, a AMP-UP Audio (Core3D) powered Audio Jack and several USB 3.1/3.0 ports. A single Killer E2221 port is featured on the motherboard. Three PCI-e 3.0 x1 slots are also found along with two M.2 ports, storage includes 6 SATA III 6 GB/s ports and two SATA Express ports. I/O includes VGA, DVI connectors, several USB 2.0/3.0 ports along with the USB 3.1 (Type-C) port and also a single PS/2 port. 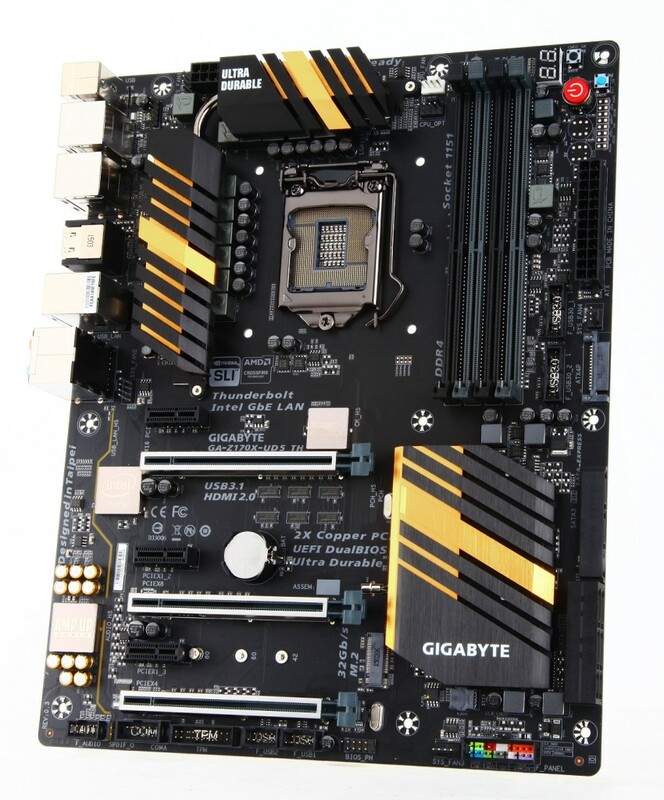 The Gigabyte GA-Z170X-UD5 TH is another top level board which will be falling a tier blow the GA-Z170X-UD7 TH. The motherboard features the LGA 1151 socket, powered by a 12 Phase Digital All power design that is cooled off by a large copper heatpipe based heatsink solution with gold and black color scheme. The four DDR4 DIMM slots can support capacities of up to 64 GB memory with speeds of up to 3400 MHz (O.C+).Expansion slots include three PCI-e 3.0 x16 and three PCI-e 3.0 x1 slots while a single PEG Power connector provides additional power to the expansion slots. Storage options include 6 SATA III 6 GB/s ports and three SATA Express with speeds rated at 16 GB/s. This motherboard has a Intel GbE powered ALN port, two USB 3.0 and two USB 2.0 ports are placed internally while I/O includes a Intel GbE LAN port, a 7.1 channel audio jack along with several USB 3.0/USB 2.0 connectors and One USB 3.1 (Type-C). 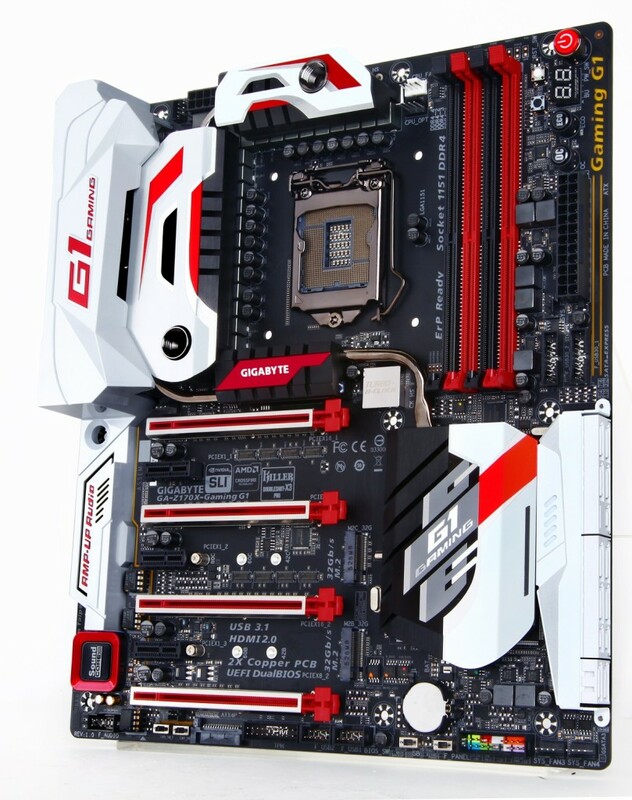 Last up, we have the Gigabyte GA-Z170X-UD3 motherboard that is an entry level motherboard. Being a basic board, this motherboard has a 12 Phase power layout that is powered by a 8-Pin and 24-Pin connector. Four DDR4 DIMM slots, three PCI-e 3.0 x16 and three PCI-e 3.0 x1 slots, 6 SATA III 6 GB/s ports and two SATA Express ports. The I/O features are limited to VGA, DVI, Intel GbE powered ALN port, a 7.1 Channel audio jack and a mix of USB 3.1/3.0/2.0 ports. Expect availability of Gigabyte motherboards on 5th August when Skylake processors launch.